Alsace’s most traditional dishes serve with charcuterie are a blend of German and French influences. 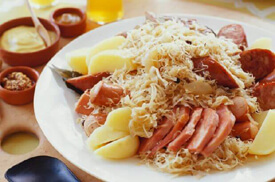 One of these dishes is called “choucroute Alsacienne”, which means Alsatian sauerkraut. I want to teach you what I’ve learned from the great chefs I’ve had the chance to cook with. I learned how to make this dish a long time ago, but it still remains one of my favorites! The class also includes a recipe for Oven-Roasted Beet Salad!